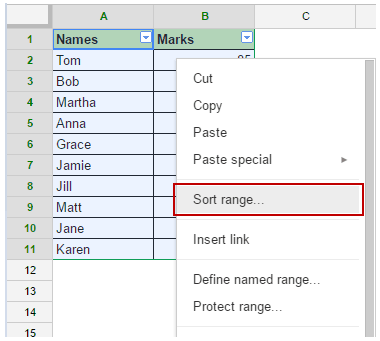 If you work with data in Google Sheets, sorting is a feature you would need quite often. 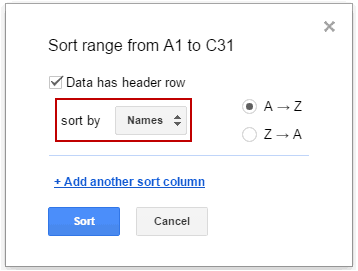 In this tutorial, you’ll learn how to sort data in Google Sheets. 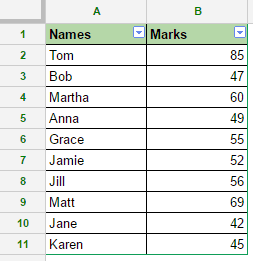 Now you can sort this data with names in an alphabetical order or marks in an ascending order. 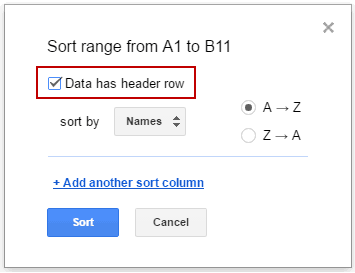 Select the entire data set (A1:B11). Right click anywhere in the selection and click on Sort Range. 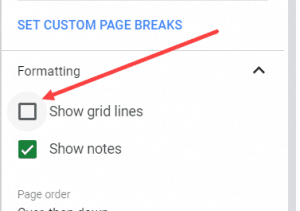 Check the box for ‘Data has header row’. 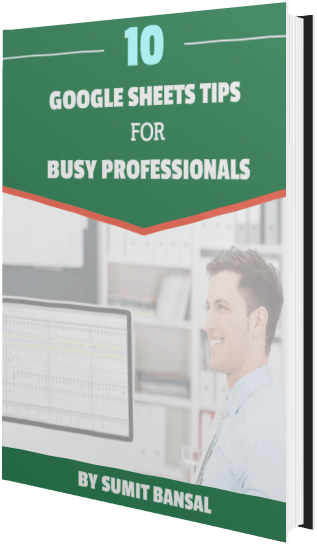 Select the column for which you want to sort. In this case, it’s the Names column. 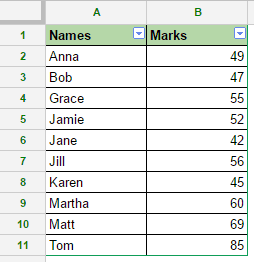 This will sort the names in an alphabetical order (along with the numbers). The same way, you can also sort based on the marks. 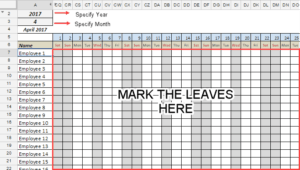 In that case, you need to select marks as the column to be used for sorting. 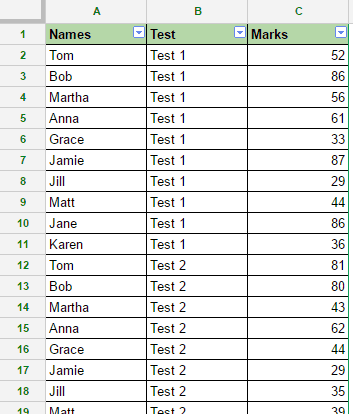 Suppose you have a similar data set, but now, you have the marks for each student for three tests (Test 1, Test 2, Test 3). Now you can do a multi-level sorting with this data set. In this case, you can first sort the data by name and then by Test. That will group all the three test scores for each student. 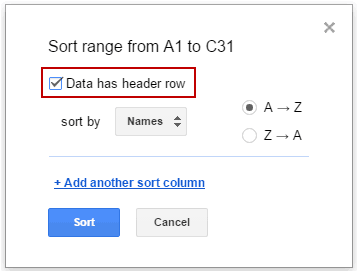 Select the entire data set (A1:C31). 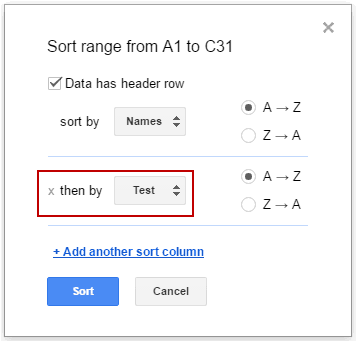 Right-click anywhere in the selection and click on Sort Range. 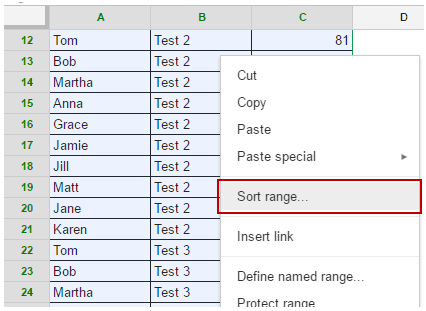 Select the column for which you want to sort first. In this case, it’s the Names column. Click on ‘Add another sort column’. In the ‘then by’ drop down, select Test. 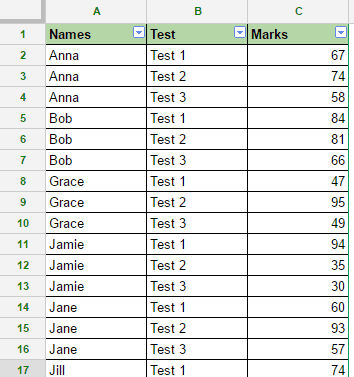 This will sort the data first by the names and then by the test name. 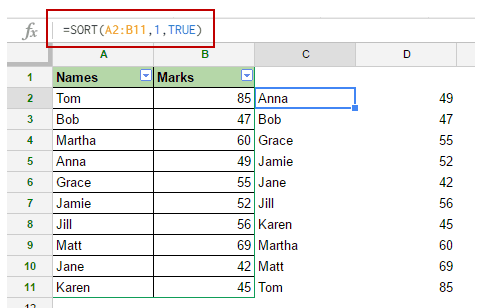 Note: If you want to keep the original data intact, make a copy and then perform the sorting on the copied data. 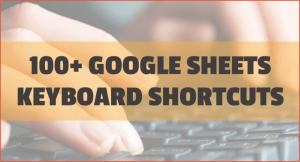 Google Sheet has a wonderful function that makes the sorting easy as pie – the SORT function. The column based on which the sorting is to be done. In this case, it is column 1. The order (ascending or descending). If this argument is TRUE, it sorts in the ascending order. Note that you can sort multiple columns as well. 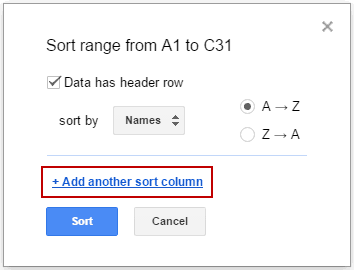 In that case, you need to supply the column number and the sorting order. You can not delete a part of the result. If you have to delete it, you need to delete the entire result of the SORT function. If there are any filled cells in the range that would be taken up by the SORT function, it would return an error. 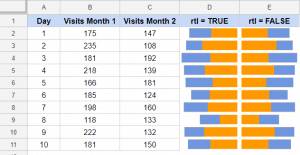 How to Search in Google Sheets and Highlight the Matching Data.